Sunday morning I went to Canary Wharf for the last in a series of yoga classes at Crossrail Place Roof Garden with Third Space London. I couldn’t think of a better way to start a Sunday than stretching out with the sun beaming on my face and a beautiful garden view. 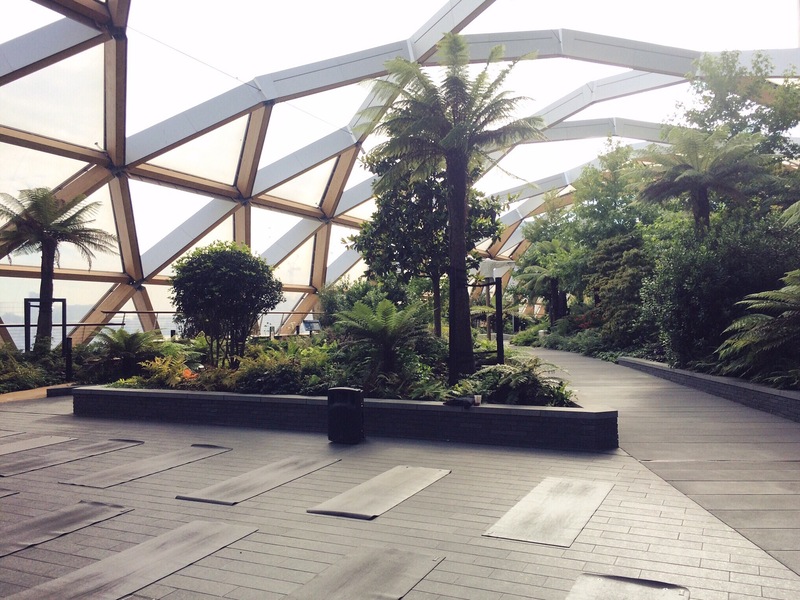 Crossrail Place Roof Garden is a great, half-open tunnel space in Canary Wharf filled with plants and trees. Part of Canary Wharf Group’s sustainability strategy and focus on increasing biodiversity in the area, it provides both a recreational space for the public and an events space for the local community to use. Crossrail Place sits almost exactly on the Meridian line and the planting was arranged to mirror the hemisphere the plant is from; with Asian plants to the east and plants from the Americas to the west. The presence of flora also improves the surrounding air quality, by capturing carbon dioxide other pollutants during photosynthesis. This carbon capture also aids climate change mitigation. So what better place to breathe deeply, stretch out, and think about what truly matters than an roof garden. Yoga is great for stress relief, helping you to relax and forget about everyday worries. It can clear your mind of materialistic matters and allow you to focus on what’s really important. Yoga can slow down your heart rate and lower your blood pressure, found to strengthen the immune system and lower cholesterol. It’s also great for improving posture. We often sit hunched over computer screens or on our phones, so practising yoga can help you to realign your posture by strengthening your abs and back muscles, and encouraging you to sit or stand tall. There are many different styles of yoga so if you haven’t tried it before have a Google and see what you think you might like. My favourite is Vinyasa, a sequence of poses that flow into eachother. I find the repetition of high plank into chaturanga (plank half way down/the bottom of a tricep push-up) really works my upper body and abs, giving me both a relaxing and toning workout. You can find loads of videos online if you want to workout at home, I love Tara Stiles, but I would definitely recommend going to a few classes as the instructor will be able to correct your alignment and make sure you’re in the right position. 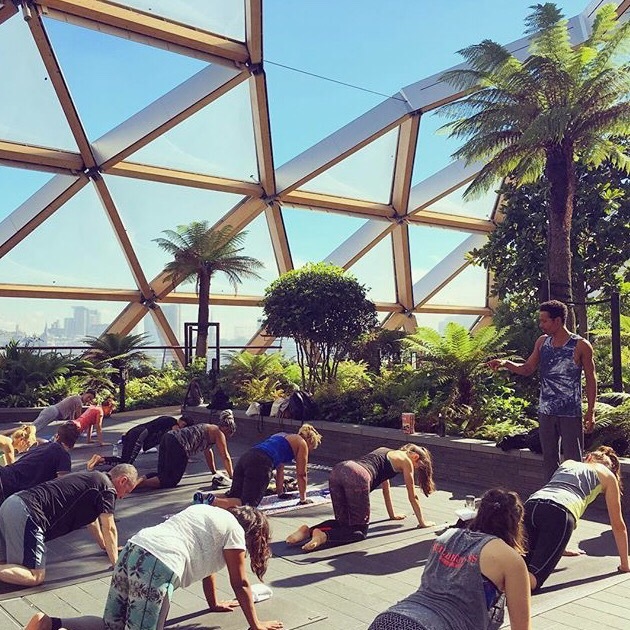 Third Space London are currently running free fitness classes both at Crossrail Place roof gardens and London Riviera until the end of the summer, check eventbrite for more info and to book your place at one of these amazing locations!